There were doubtless many of us who were shocked to hear of James Taylor's sudden retirement from all forms of cricket following the awful news of his serious heart condition. 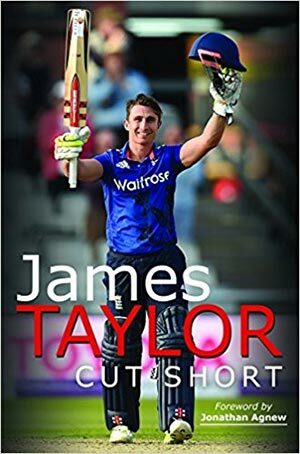 Cut Short, an appropriate title, takes us through James's traumatic experiences which ultimately left him without the main purpose of his young life. As many will know, James was making a worthy case for a permanent place within the England side after success with both Leicestershire and Nottinghamshire and, suddenly at the age of 26, he was left contemplating a totally different lifestyle and, for one in his prime years, one which does not allow a lot of exercise. Cut Short is a moving story. James takes us through his earlier years and reveals himself as a little bit of a scamp at school but, with help from devoted coaches, early success always made it likely that he would play at a higher level. His time with Leicestershire and initially Nottinghamshire was not always straightforward but impressive performances were beginning to make him an England regular at the time of his diagnosis. James writes with refreshing honesty and comes over, as he writes of himself in the book, confidently. His views on team-mates are at times illuminating. During the dark days after his premature retirement, James pays tribute to his now wife, Jose, and the further support of his family. The possibility of the ARVC gene being hereditary and the possible impact on a future family is also discussed. The effects of living with such a condition must be debilitating but, with his acceptance and positive outlook, James has quickly made himself a pleasing presence and impressive media person in a very short while. Many, myself included, will wish James every success and be grateful that he has had the opportunity to remain involved in cricket. As he points out, his condition is often discovered too late and we are therefore most happy that his cheerful presence is still around off the field. Cut Short is a remarkable story and deserves to be a resounding success.